Always renew oil seals which have been removed either as an individual component or as part of an assembly. Never use a seal which has been improperly stored or handled. Take great care when removing old seals that the sealing surfaces and seal housing are not damaged. Carefully examine seal before fitting to ensure that it is clean and undamaged. Ensure that the surface on which the seal is to run and also the seal housing is clean and free from burrs or scratches. Renew the component if the sealing surface cannot be restored. Special tools and protection sleeves are provided for fitting the majority of seals and must be used when specified. Many seals are now coated with a protective wax and DO NOT need to be lubricated prior to fitting. Always check the relevant repair procedure which will state if a seal must be fitted dry. Never touch these seals with oily hands as the oil will contaminate the protective coating and affect the sealing properties of the seal; also, ensure that fitting tools and protection sleeves are free from oil and grease. Seals which must be lubricated prior to fitting should have the recommended lubricant applied to the areas specified in the repair procedure. Ensure that a seal is fitted the correct way round. 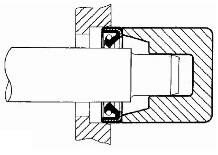 For example, the lip of the seal must face towards the lubricant which it is sealing. When fitting an oil seal, ensure that it is positioned square to shaft and housing. Where the seal is to be fitted to a housing prior to fitting over a shaft, take care not to allow the weight of an unsupported shaft to rest on the seal. Always use the recommended special tool and protection sleeve to fit an oil seal. If no tool is specified, use a suitable mandrel approximately 0.4 mm (0.015 in) smaller than the outside diameter of the seal. Use adhesive tape on the shaft to protect the sealing lip of the seal. Press or drift the seal in to the depth of its housing if the housing is shouldered or flush with the face of the housing where no shoulder is provided. Ensure that the seal is not tilted in the housing when it is fitted.